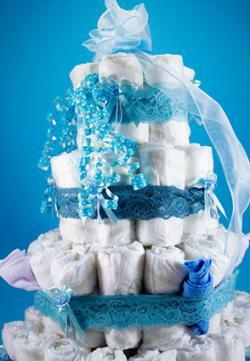 Baby shower diaper cakes have become popular gifts. 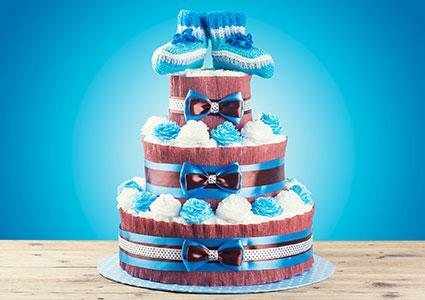 While they won't take the place of a shower cake, diaper cakes make a great conversation piece. Everyone will want to know where you got the idea, and this gift will be an instant hit with the mom to be! After all, parents can never have too many diapers! Keep reading for some easy instructions on how to make a baby shower diaper cake. These instructions are for a three or four-layer diaper cake, but you can easily modify them to make a smaller version. Gather all of your supplies ahead of time, so you won't have to stop working to search for something. Stand back periodically to check your progress, and don't forget to have fun! First, you'll need to make the form for the cake. Decide on the diameter of the bottom layer, and then subtract one inch. Use this number to draw an appropriately sized circle on the cardboard. Cut out the circle. Use packing tape to affix the wrapping paper tube to the center of the circle. Put one large rubber band over the tube. Beginning at the base, start rolling diapers and tucking them into the rubber band. Continue adding diapers until the bottom layer is just slightly larger than the cardboard base. Repeat this process with each layer. You'll use fewer diapers as the layers get smaller. Between layers, tie several long pieces of ribbon around the wrapping paper tube. Allow the ribbon ends to hang out between the layers. When you're done assembling the basic part of the cake, the wrapping paper tube will be sticking out the top. Trim the tube to about an inch, and use a hole punch to make four holes in it. Thread pieces of ribbon through the holes, and leave the ends long. Use wide ribbon to cover the rubber bands on your cake. You can also cover the layers with a receiving blanket if you prefer a smoother appearance. Tie baby items to the ribbons hanging out between the layers. Then use the ribbons at the top to affix your cake topper. Don't forget to stand back and admire your work! To start, you'll need to roll the diapers vertically into cylinders and use scotch tape or rubber bands to hold the shape. You can use paper towel rolls if you need more structure. Make the bottom layers first by attaching the diapers together either with safety pins, tape, or rubber bands. Now you can easily form a cylinder which will represent the bottom layer of the cake. Many people prefer to wrap the bottom layers of the cake with a receiving blanket. You can attach the tiers to each other with adhesive or pins. The top layer should contain a special item, like a baby bottle, stuffed toy, silver cup, or other keepsake item. If you use a bottle, you can attach the diapers around the bottle. Stuffed animals can be pinned to the top layer of the cake. Other items, such as teething rings, small squeaky toys, hair ribbons, pacifiers, etc. can also be used to decorate the cake. Be as creative as you like. A popular variation of the diaper cake uses a nursing pillow or "boppy" as its base.Available at baby stores, department stores, and on the Internet, Boppy pillows are great for supporting a baby during nursing or bottle feeding. These pillows are shaped like the letter "C," and they can help reduce back pain due to holding a baby for extended feeding sessions. They can also be great for a new mom who is recovering from a C-section or difficult delivery. Boppy pillow slipcovers allow you to change the fabric and color of the pillow to complement the nursery décor. To get started, place the Boppy pillow on the cardboard, and trace around it with a pencil. Next, cut just inside the line to create a cardboard base that is slightly smaller than the pillow. Use the packing tape to affix the wrapping paper tube to the center of the cardboard base. This tube will be the center support for your cake. Put the slipcover on the Boppy pillow, and slide the pillow onto the center support. The pillow will be the bottom layer of your cake. Use one receiving blanket to fill in any gaps between the wrapping paper tube and the Boppy pillow. Place one of the large rubber bands over the wrapping paper tube. Begin rolling diapers and tucking them into the rubber band. Continue rolling and tucking the diapers until the next layer of the cake is a few inches smaller than the Boppy. Make a third layer for the cake by placing another rubber band on the tube, just above the previous layer. Roll and tuck diapers into this rubber band until you complete the third layer. Cut the wrapping paper tube so that it protrudes from the top layer by about one inch. Use a hole punch to make several holes in the tube, and tie ribbons through the holes. You can use these ribbons to attach small gifts to the top of the cake. Wrap the two diaper layers with receiving blankets and tie with ribbon. Don't feel creative enough to make your own baby shower diaper cake? No problem. Check out these Websites, and you can order a ready-made diaper cake for a perfect gift.